What I post here is a review of my book Cyberteologia. Pensare il cristianesimo ai tempi della rete [Cybertheology. Thinking about Christianity in the era of the Net] written by Maria Way (researcher on Media and Religion, London) and published on Communication Research Trends, Vol. 31 (2012) no. 3, pp. 37-41. I consider this review a great introduction to Cybertheology for English speaking people who what to know more about it. Antonio Spadaro, s.j. is the Editor of La Civiltà Cattolica, the sometimes controversial Jesuit journal. Here, he attempts to address what he sees as a lacuna in literature on the internet: the relationship between the internet and theology. He considers that theology is, according to a ‘classical’ (although there is no designation of its origin) definition: ‘..intelligence of the faith, and we know well how intelligence, understood as critical and reflexive knowledge, is not extraneous to cultural changes that are underway.’(p.11, all translations are mine). This book’s genesis was a request that he speak on internet and faith at an Italian Bishops’ Council, Office of Social Communications’ conference on digital witnessing. No doubt he was asked because of a number of articles he had written in Civiltà Cattolica and his two previous books: Connessioni: Nuove forme della cultura (Connections: New Forms of Culture) (2006) and Web 2.0: Reti di relazione. (Web 2.0: Webs of relationships) (2010). What impact has the net had on the way we understand the Church and the ecclesial communion? What impact has it had on the ways in which we think about Revelation, grace, liturgy, the sacraments and classical theological themes? ‘if Christians reflect on the net, it is not only to learn to use it well, but because they are called to help humanity and to understand the profound significance of the web itself in God’s project, not as an instrument to use, but as an ambience to inhabit’. We often forget that the Catholic Church has used the available means of communication for its main purpose – evangelization – since it began. Electronic communication methods are just another of these means. Spadaro says he is neither sociologist, nor technician, but trained in theology, philosophy and literature. He believes that this formation has informed his views and interests on the web. Amongst influences mentioned are Marshall McLuhan, Gerard Manley Hopkins, Flannery O’Connor, Walt Whitman, St. Thomas Acquinas, T.S.Elliott, Teilhard de Chardin and one Karol Wojtyla, He also notes the encouragement of Mons. Claudio Celli, President of the Pontifical Council for Social Communications (PCCS) and Cardinal Gianfranco Ravasi of the Pontifical Council for Culture (PCC). 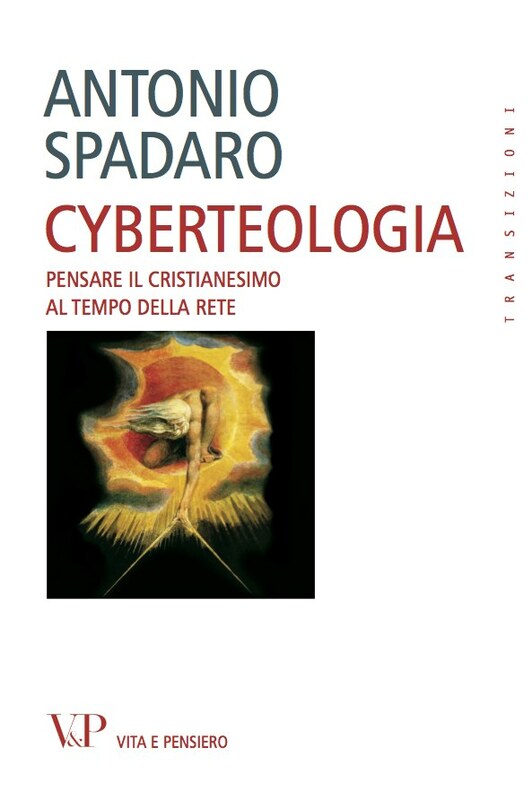 To develop the project further he opened his blog ‘Cyberteologia’ on January 1st, 2011, then his Facebook page ‘cybertheology’, a twitter account (@antoniospadaro) and ‘The CyberTheology Daily” at http://www.cyber-theology.net which offers content curation and other initiatives. By starting these sites he hoped to make his reflection on cybertheology social. Since April, 2011, he has edited a monthly column on Cybertheology in the journal Jesus. Spadaro notes that the Church’s task, like that of all individual ecclesial communities, is to accompany man on his path and the Web is now an irreversible and integral part of this path (p.10). a. The study of communication as a context for theology. b. The use of communication structures to modulate theological reflection. Together with the voyage trail, many new forms of religiosity are born on the Net. He notes (p.30) that reflection space must be found there, and if this is true in general, it is possibly even more true for the ‘digital native’, While they already have the internet as part of what he calls their ‘daily bread’, for ‘natives’ and others it is necessary to take up a new task in the ways we formulate and hear a symbolic public language that speaks to us of possibilities and signs of transcendence in our lives (p.28). He attempts to clarify just what it is that he means by the term cybertheology, using the work of Herring, George and Formenti, amongst others, to help him. In his next chapter, Spadaro discusses the increasing use of personal music players (i-pods, etc.) which have changed many lives, since they provide a sort of soundtrack to everything. As part of this metaphor, he talks of the need to listen (about which Benedict XVI has also spoken) in our search for God. Listing things related to religion and spirituality which can be accomplished on the web, he warns (p.36) against the illusion that religion is available at a mouse click, a sort of religious supermarket, where everything is available to the religious consumer. The seeker must decode the information that surrounds him and can take up a classic publicity mechanism, offering answers to as yet unformulated questions. Religious questions are changed into a confrontation between plausible responses and subjectively significant ones (p.38) He suggests we use what I have always thought of as a particularly Jesuit word: ‘discernment’, in the choices we make. In our search for God, we must find a strong, personal spiritual centre, able to unite the fragmented messages which profoundly affect us (p.39). It is, of course, possible that the Gospel, as one message among many, will be put aside (p.44). Far from comforting, the Word may disquiet us. In an English Google search for ‘God’, he says that what first comes up in the list offered are ‘Godaddy’, God of War and God of Metal – a commercial company, a videogame and a heavy metal festival! As he notes, finding God in a Google Instant age has, ironically, been made difficult (p.46). On asking whether God exists (p.47), one is answered: ‘I’m sorry, but a poor computational knowledge engine, no matter how powerful, is not capable of providing a simple answer to that question’. (http://www.wolframalpha.com). ‘In regard to the Magisterum, it is as if the whole world population is present in a little room in which a perpetual dialogue is possible. (Thus) the Magisterum is simultaneously tried in all the visible Church’ (p.147). Spadaro does, however, note problems associated with a hierarchical organisation on the Web, which is by its nature a non-hierarchical structure – perhaps one of Luhmann’s social systems par excellence. He notes that the Church has another logic than the internet, it has a received and given message that breaks through the horizontal from above. It lives by its own witness, tradition, by the Magisterum whose mission is to safeguard the people of God so they can profess the authentic faith. That Magisterum must watch over those people until they can remain within the truth that liberates (p.68). These two logics of being may seem to be irreconcilable. Spadaro notes that on the Web, the hierarchy may be invisible and so become even more ‘occult’ than before. Thirdly, he notes the most decisive point, one that is critical in his horizontal situation and in the habit of doing something that is less than transcendent — the weakening of the capacity to return to an overarching reality and alterity in favour of a flattening out into immediacy and self-referencing (p.69). All internet links are connected with all others and this, with the development of Web 2.0 has brought about an internal web hierarchy, one which is mobile and whose knowledge, Spadaro believes, is part of an open system. Here, I would perhaps disagree with him. While there is information (which sometimes may even be correct) on the Web, information is not the same as knowledge. Knowledge is available to an individual only if and when he/she has processed information personally and retained it in that processed form. This is perhaps pedantic on my part, but does have some relevance. Faith is not something we can find on the internet. Faith is, to use Spadaro’s terms in regard to the Magisterum, a form of truth. It is something that may come to us with time through processing information, or it may arrive unexpectedly as a gift. He notes that the un-hierarchical nature of the Web does not mean that there is disorder there — there is a certain grammar to it. Within this grammar are the social networks and here (p.70) he quotes de Kerckhove (from Bertani, C. (2007:158) ‘Dal Brainframe visivo al santo elettronico. Intervista a Derrick de Kerckhove’. (From the visible brainframe to the electronic saint. An Interview with Derrick de Kerckhove)), who has written on the aura that may develop around somebody immersed in the digital world and in social networking sites, forming ‘..a dimension of sanctity around a saintly person which has a therapeutic value. The contact with this saint confers health.’ However, aura, I would propose, can also surround those who are less than saintly. One thinks here, perhaps of Julian Assange, the Wikileaks instigator, who has been taken up by some as a form of digital guerilla, doing good work, despite the harm that it is possible that he has done. This leads us to the following chapter, which deals with the hacker. While he points out that ‘to hack’ means to break into pieces, among other meanings, he begins by putting quite a positive spin on hacking. The hacker is, he writes, one who has: ‘a sort of life philosophy, an existential attitude, playful and driven, who pushes towards creativity and sharing, opposing models of control, , competition and personal property.’ (p.75) and quotes from Stephen Levy’s (1984) work on what a hacker should be. He differentiates between hackers and crackers (who are those who break things up). Briefly outlining the birth of the personal computer age (something I am old enough to remember) he puts forward the idea that ‘… the hacker has a precise perception of the importance of giving a personal and original contribution to knowledge.’ (ibid) and it is here that he ties the hacker to Christianity, quoting Pittman (http://www.ittybittycomputers.com/Truth/GodOfTruth.htm) who wrote that he ‘.. as a Christian thought I could feel something of the satisfaction that God must have felt when he created the world.’ For Spadaro this suggests that Pittman sees his creative work as part of God’s work in the creation. I leave the reader to draw their own conclusions on this. On p.76, Spadaro quotes from Raymond, who suggested that ‘..the world is full of fascinating problems that are waiting to be solved.’ Theology tries to solve some of those problems that relate to religion and religious belief, but I am perhaps less happy with the hacker than Spadaro seems to be, since many ‘hack’ solely to cause problems of one sort or another. As a university teacher, I am also less enthusiastic about Wikipedia than Spadaro. While some Wikipedia pages are accredited to an author, there are many opportunities for people to put in false information and there is no academic backup for the ‘pages’. However, the author does manage to tie in the open source and the knowledge (or, as I would have it, information) on the web to religious organisations. His question: ‘Aren’t the ethics of the hacker en route to a collision with the catholic mind and its vision of authority and tradition?’ (p.84) which he asks after a section on ‘open source theology’ and its problems, is one that is interesting. He suggests that the form of collaboration that the web engenders is something that the Catholic Church has increasingly to contend with and that this will inevitably lead to a mutation in the ways in which we look at the world. Here, I will take his lead in relation to connecting the web to religious organisation. Surely, contact with religious thinkers around the world has always led to changes in thought. Are we here perhaps forgetting the history of media of various sorts. The speed of exchange may increase. The amount of information available may be greater, but there is always a limited number of people who are interested in theology as a discipline. The medium has changed, but not necessarily the message, to paraphrase McLuhan. Spadaro suggests that the web is the site of a ‘gift culture’ through Peer-to-Peer sharing and here he does see problems, since the Church has more of a client-server basis, due to its revelatory nature, than peer-to-peer basis (p.87). The nature of p2p is not wrong, he opines, but is in itself valuable (p.89). His answer to the earlier question seems to be that ‘The Church is not and never will be simply a ‘cognitive society’, and the logic of grace is different from that of information.’ and he notes that the reflections here are those that the Catholic vision of authority should turn to critically in the hacker culture (p.92). His fifth chapter considers ‘Liturgy, Sacraments and the Virtual Presence’. He asks on p95 if it is possible to imagine liturgical and sacramental forms on the web, following Marshal and Eric McLuhan’s questioning (in 1973) of the ways that media might change liturgy, although he notes that these are questions are ones that have already been asked in regard to other media. In the Catholic Church the question has been posed as to whether somebody hearing a papal blessing on the radio, or seeing it on tv, actually receives that blessing. The decision was that if you saw or heard it live, you got the blessing. Recordings don’t count! For those who are housebound or infirm, liturgy on radio and television has been a boon. On the web, we can watch or listen anywhere in the world, but satellite technology has been providing this service for years, and radio before that. The hierarchy of the Catholic Church, as Spadaro notes on p.99, is firm in saying that virtual reality can never replace ‘real’ reality. One of the Catholic tv channels in Italy had, and may still have, Exposition of the Blessed Sacrament for a period of time. No comment, no music, just a monstrance displayed on the screen. I pointed out that ‘being in the real presence’ meant that you were there, not watching on tv at home (for information about this see, for example, http://www.nccbuscc.org/liturgy/innews/699.shtml) By relating internet games played with avatars, Second Life, for example to the document on The Church and the Internet (see www.vatican.va/…/pontifical_councils/pccs/documents/rc_pc_pccs_doc_20020228_church-internet_en.html ), in which the Church notes that it is possible, through the grace of God, to talk about religious experiences, even on the web, Spadaro has managed to make a neat connection. He notes also the problems that new technologies may cause with this doctrinal problem. Due to the nature of some of my own work, I found this particular chapter both informative and interesting. Spadaro’s final chapter links thinkers, both theological and media scholars, whose work he considers relevant to his thesis. These are not only Catholic or Christian thinkers, but references are made to Islamic scholars also. This is an interesting book which will, I hope be translated into English to give it a larger audience. There is an extensive bibliography which contains, although I am sure he is too modest to draw them to your attention, three entries from the Editor of this journal. The bibliography in itself will be useful in approaching a relatively new topic which will, I am sure, run and run. This entry was posted in link, reprints and tagged antono spadaro, cyberteologia, cybertheology, Maria Way, Media and Religion, teologia, Theology. Bookmark the permalink. ← La rete, una risorsa di senso?